Private sector emergency preparedness should establish assurance in the ability to respond to potential incidents, instill a culture of preparedness at the workplace, and provide a means of business continuity. Through the emergency preparedness process, businesses have a better chance to maintain financial security in the event of an emergency, for both the company and its employees. Businesses, both large and small, are the backbone of America’s economy and, as a result, need to prioritize emergency preparedness for the sake of our nation’s security. For a company to be successful in emergency response planning, the support of upper management is essential. The executive leadership team needs to set the tone by authorizing and directing senior management to institute emergency preparedness measures and financially support those efforts. Budgetary restraints and the dedicated man-hours required are the main reasons emergency preparedness may be a lower priority in an organization. It is understandable that businesses are trying to operate efficiently and profitably. Unfortunately, it may take a regulatory compliance issue or incident to move emergency preparedness to the forefront. Allows companies fulfill their moral responsibility to protect employees, the community and the environment. Facilitates compliance with Federal, State and local regulations. Establishes processes and procedures to enhance a company’s ability to recover from financial losses, limit or eliminate regulatory fines, loss of market share and corporate reputation, damages to equipment or products, and business interruption. Reduces exposure to civil or criminal liability and lawsuits in the event of an incident. Enhances a company’s image and credibility, and fulfills moral responsibilities to protect employees, customers, the community, and the environment. May reduce your insurance premiums. Emergency management is a dynamic process. Planning, though critical, is not the only component in an emergency preparedness program. Training, conducting drills, testing equipment, and coordinating interoperability with the community are instrumental for any emergency preparedness program. For tips and best practices on designing a crisis management program, download Best Practices for Crisis Management. Documentation in Disaster Management - Where do we start? Disaster or emergency management documentation can take place in many forms. Some companies use hand held devices to record emergency observations from on-site field locations, while others depend on a central emergency operations center. Regardless of the communication method, or centralized or decentralized location, vital detailed information that incite emergency procedures must be documented as soon as practical during or immediately after an emergency incident. Record only facts, not speculation. If participant does not know a particular fact, do not allow speculation or elaboration. Do not criticize other people's efforts and/or methods. Do not speculate on the cause of the emergency. Do not relate unqualified opinions. Was an evacuation called for, and if so, how much time was required to evacuate all personnel? Did the designated alarms function properly? Were all employees accounted for? Did on-site equipment satisfy equipment needs? If not, what additional equipment was brought to the site? Were procedures implemented as described in the Emergency Plan? Were there any areas for improvement identified during the incident? List specifics. Did local jurisdictions assist in the emergency response? If so, did they offer suggestions for improvement? Documentation of an emergency incident is a critical part of an emergency plan. Visual, audio, and written recordings should be made, detailing each step of the emergency response in order to provide a clear understanding of the events that occurred. Information and lessons learned from previous incidents can be used to prepare a more functional emergency plan for the future. With the increased number of natural disasters and school-related incidents during the past year, school administrators need to be certain that their emergency operations plans are effective and functional in the event the unthinkable happens. According to the Readiness and Emergency Management for Schools Technical Assistance Center, developing protocols to prepare for all-hazards should be done with the input, support and direction of community partners, including officials from law enforcement, fire safety, public safety, public and mental health and the emergency management fields. This includes establishing a communications plan that can quickly relay information among school districts, staff, students, and outside support agencies. Advancements in technology has significantly improved the potential for effective communications during a natural disaster. Below is a list of lessons learned from San Diego County Office of Education in response to wildfires that rapidly spread through the area threatening schools and its occupants. Establish a district conference call phone line. This enables all area superintendents to communicate collectively during a crisis. Acquire a mass notification system to communicate with staff and parents. During a crisis, regularly update staff and parents through this system and the Internet. Conduct semiannual mass notification tests to staff and students to ensure accurate contact information. Develop contact lists. Ensure that the list includes contact information for key individuals in each district or school, with multiple points of contacts, including work phone, cell phone, home phone, and e-mail. Designate key district and/or school staff as the holders of contact lists containing contact information for superintendents, principals, alternates, and other key district staff. Update the list quarterly and provide copies to the local law enforcement and local emergency management agencies. Have the holders of contact lists keep copies at work, home, and in their personal vehicle. This ensures that at the onset of a crisis they have the means to contact each other immediately. Develop decision trees. School districts may be required to make quick decisions. Decision trees need to be kept current so that everyone who is part of the decision-making process can be in communication with one another as soon as a crisis begins. Further, decision trees are critical because the movement of such wildfires is highly unpredictable. The fact that a wildfire is in one part of the county does not mean a school in another part does not have to be on alert. Always have an amateur radio units in your Emergency Operations Center. Amateur radios may be outdated, but they are also the last type of communication to fail. After an incident, remember to debrief, identify lessons learned and weaknesses in the emergency management plan, and revise the plan accordingly. Just because the crisis is over does not mean the emergency management process has ended. According to FEMA’s Comprehensive Planning Guide, there are six key steps in developing an Emergency Operations Plan. At each step in the planning process, emergency planners should consider the impact on required training, exercises, and equipment costs and availability. Identify a Core Planning Team: Typically this includes an emergency manager or security manager, a hazard mitigation expert, local jurisdictions, and any additional available planning experts. Engage essential personnel in planning process to identify capabilities and resources. Assess Risk: Assign probability values to threats and hazards for the purposes of determining priorities, developing processes and procedures, and allowing for informed decision-making. Understanding the consequences of a potential incident can help prioritize resources and response efforts. Identify Operational Priorities: Specify desired operational outcome(s) for emergency responders, employees, and facility, and define a success for each operation. Set Goals and Objectives: Clearly indicate the desired result or end-state the response is intended to achieve. Develop and Analyze Course of Action: Planners should consider requirements, goals, and objectives to develop at least two options for response. The planning team should work through a process by using tools that allow participants to visualize typical operational flow to determine best suitable procedural options. Identify Resources: Match available resources, both internal and external, to requirements, response obligations, and assignments. This can identify internal response shortfalls that require outside capabilities and additional response assistance. Identify Information and Intelligence Needs: Planners should identify the information and intelligence necessary to drive decision-making and trigger critical response actions. Write the Plan: The results from the priorities, goals and objective in Step 4 should provide an outline for a rough draft. As the planning team works through successive drafts, participants should add necessary supporting information, graphics, and/or photos taking note to comply with local, state and federal regulations. Review the Plan: Planning is a continuous process that does not stop when the plan is published. Plans should evolve as lessons are learned, new information and insights are obtained, and priorities are updated. Utilizing a web-based plan allows for simple edits and access from multiple locations, allowing for a comprehensive review, despite location of participating parties. Approve and Disseminate the Plan: Senior management and associated regulatory agencies typically grant emergency plan approvals. The planner should then arrange to distribute the plan to associated parties and maintain a record of the individuals/ organizations that received a copy (or copies) of the plan. Exercise the plan: Evaluating the effectiveness of plans involves a combination of training events, exercises, and real-world incidents to determine whether the goals, objectives, decisions, actions, and timing outlined in the plan can lead to a successful and effective response. Review, Revise, and Maintain the Plan: Planning teams should establish a process for reviewing and revising the plan. Reviews should be an ongoing and recurring activity. 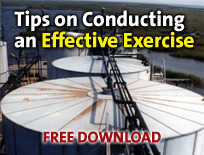 For tips and best practices on designing a crisis management program, download Tips for Effective Exercises. The process of developing a campus emergency plan to adddress terrorism can be overwhelming for school administrations. However, the potential for terrorist attacks makes it imperative that emergency plans include strategies to protect campuses, students, and staff. All schools should build on existing plans, work closely with local emergency agencies, and rehearse their plans accordingly. It is essential that the roles and responsibilities of educators, law enforcement, fire officials, and other first responders are clearly described, reviewed, and updated. Communication procedures should detail methods of information distribution, including social media tools, between those on and off the site, parents, emergency responders, the community, and the media. One of the greatest challenges in incident management comes with the unpredictability of an ongoing situation and the communication shortfalls of the systems and processes in place. Regardless of the incident, the ability to establish a quick and effective response, and internal transparency for every step in the incident management process improves safety, reduces response costs, and provides more timely business continuity. Having a “real-time” incident management system in place may alleviate some of the shortfalls that occur with an incident management response. The real-time transmissions of incident details, including location, severity, impact, and status allows decisions and coordinated efforts to be tailored to the event as it evolves. Initial Response - Employees should be able to instinctively obtain essential information in real time. This allows responders to provide swift and appropriate resolutions quickly. Having the ability to establish an intuitive, customizable system is a key component of incident management. Demobilization and review: Examine overall performances and processes. This may highlight areas for improvement in your incident management process. Feedback - After an incident has been resolved, solicit feedback from responders, regulators, and employees. Post-incident feedback surveys help to identify areas for improvement and improve documentation of response actions and events. Through the development of a corporate business continuity plans (BCP), companies can limit the financial and non-financial impacts of incidents associated with emergency situations that limit their ability to access key offices or other facilities. A BCP should include a collection of the minimum required procedures and information that allow a company to maintain operations in the event of an emergency or disaster. An assessment of the impact of a disaster on an organization can quickly highlight planning needs. The process of developing a new business continuity plan should begin with a business impact analysis (BIA) to identify critical business processes. Business Impact Analysis: A management-level analysis identifying exposures of the sudden loss of critical and supporting business functions and resources. Likelihood Level: Indicate how likely each specific threat could occur considering current/ existing capabilities, mitigation measures, and history. Impact Level: Indicate how severely the process would be impacted considering current/existing mitigation measures. Staffing minimums: Identify staffing level needs (including contractors or suppliers) to meet recovery time objectives. IT requirements: If electronic data must be available to recover specific process to a minimum service level, identify the necessary data source(s) or software applications. Recovery Time: Identify how long it would take to recover specific critical processes under existing capabilities. Data Backup History: If a data source(s) is identified, indicate how old the data can be to satisfy recovery. Alternate Location Options: Identify needs and review options for off-site locations to recover critical business processes. While the business continuity planning process may be executed with in-house staff, some companies prefer to use seasoned consultants for impartial evaluations and experienced guidance. Consultants should have hands-on experience in business continuity and disaster preparedness. They must be able to comprehend core business needs and clearly communicate recommendations to the client to successfully develop a customized, site specific, and functional BCP. Health and Safety - Events or conditions that represent, cause, or have the potential to cause serious health and safety impacts to workers or the public. Technological / Infrastructure - Fire, explosion, spill/release, radiation emergencies, building collapse; failure of telecommunications, information systems, or affiliated technologies; utility service interruption (gas, water, electricity, sewer, heat). These events may or may not involve hazardous materials. Acts of Nature - Conditions that represent a threat to workers and/or facilities due to severe weather (i.e. tornadoes, lightning storm, etc.) or other natural phenomena. For planning purposes, potential emergencies can be classified into various emergency levels (ex. Level 1, Level 2). Emergency classification levels define the potential hazard to facility personnel, the facility, and the public, and classify the resource levels necessary to manage the emergency. Each higher level results in increased required resources, or response complexity to deal with the emergency. Minor or very limited potential threat to life, safety, property, or the environment and DOES NOT extend outside the immediate area or off site. Unit or facility personnel have the training, capability, PPE, and equipment to manage and control the incident, and the need for outside assistance is not required. The hazard does not require evacuation of the immediate area. No potential for loss of control or escalation. Incident Management Team is not activated. Potential threat to life, safety, property or the environment is Serious and may extend outside of immediate area, but DOES NOT extend off site. Outside emergency response assistance is necessary, or is required on a standby basis depending on the potential for limited escalation. Outside assistance is necessary for fire, rescue, hazardous materials, or mass-casualty or fatality, yet without the potential for off site impact. Area facility personnel do not have the capabilities or resources to manage the incident. Requires evacuations and/or plant alarms to warn others outside the immediate area. Security breech or situation with ongoing potential threat to life/safety. Incident Management Team is activated. Potential threat to life, safety, property or the environment is significant with POTENTIAL to extend off site. Protective actions required for nearby units/areas, and/or off site communities/environments. Potential for significant impact to company reputation, operability, or revenues. Any incident involving significant loss of safe operating control with potential for escalation. A hazard to the public exists. Emergency notification call system is activated, or may become necessary. An estimated 300 million people were affected by natural disasters in 2010. The devastation has continued in 2011 with Japan’s March’s earthquake and subsequent tsunami, the tornadoes ravaging the southeastern U.S., and massive flooding in America’s heartland. Companies must be aware of the risks posed by potential natural disasters that may impact their locations, and take sensible precautions to protect their employees, the environment, and their assets. Poor crisis management performance can be prevented. Emergencies and disasters occur as a result of an unexpected event or series of events. However, many incidents can be prevented if organizations remain vigilant with ongoing site inspections and emergency preparedness mitigation. Organizations that prioritize equipment evaluation, safety training, and emergency planning can save millions of dollars in “down-time”, possible regulatory fines, and damage to reputation. OSHA recently sited a Massachusetts manufacturing plant with $43,800 in proposed fines for 13 alleged serious violations of workplace health and safety standards. The citations were issued for a lack of an emergency action plan, an inadequate employee training program, failure to evaluate respiratory hazards, unmarked exit routes, unlabeled chemical containers, severely corroded electrical equipment, an extension cord used in place of permanent wiring, inadequately guarded floor holes, missing stair rails, and an improperly located and uninspected emergency eyewash/shower. Risk mitigation measures should include preparation, procedures, and equipment that can minimize the impact, likelihood, or severity of the threat. Preparation: Training programs, response exercises, and planning prepares employees to identify, and respond to emergencies. Companies should identify applicable regulatory requirements and promote understanding of those requirements to their employees. Procedures: Documented and mandated processes for periodic review and update of emergency response plans, audits, and routine safety and equipment inspections. Equipment: Despite the need to reduce expenses, lack of proper equipment (such as fire protection equipment), can result in additional financial burden. Company leadership must place an emphasis on emergency planning and training to ensure employees work in a safe environment. By providing training, assessing facilities and emergency programs, and identifying gaps and deficiencies, organizations can reduce the potential for emergencies or disastrous situations.